The Nonfiction Detectives: North: the amazing story of Arctic migration by Nick Dowson. 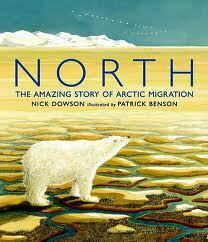 North: the amazing story of Arctic migration by Nick Dowson. A copy of the book was checked out from the public library. Nick Dowson introduces migration to the Arctic, "this huge place that sits at the top of our world" in this visually stunning book. We learn that the winter months are long and cold and we see a landscape in hues of blues and grays were everything is snow and ice. Yet this hostile environment changes when summer burst forth teaming with life. "It's summer in the Arctic. All day and night, the sun spreads light, warming soil and water. Tundra flowers glow rainbow-bright, the calm air hums with summer bees, and mosquitoes rise like smoke from shining pools. NEW LIFE IS EVERYWHERE…"
Using watercolor, pen, and pencil, Patrick Benson's exquisite illustrations bring the sparse text to life. The book is 30 cm., the same size as most picture books, but it feels larger because the double-page spreads take up all the space, making you feel as if you are right there in the Arctic witnessing this incredible act of nature. Especially, the transformation from winter (gray tint) to summer (teaming with greens, blue sky, and colors for flowers) and back to winter again. 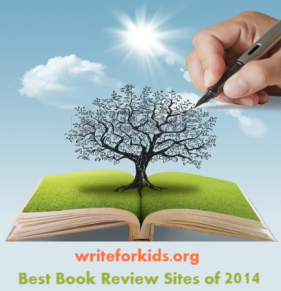 Many of the pages are wordless as we witness the different creatures making their journey. Students will be intrigued by the facts. The gray whale leaves Mexico to travel five thousand miles, over eight weeks, passing Los Angeles, San Francisco, Vancouver, Anchorage. While the bar-tailed godwits make their way from New Zealand. This book that belongs in all libraries.